The men and women who carry out the mission of the Architect of the Capitol (AOC) to serve, preserve and inspire are frequently in full view of the public. And then there are the staff that work behind the scenes, in corridors, crawlspaces and nooks that resemble secret passageways. These hidden spaces are constricted — you often have to bend over and in some cases literally crawl. But these areas are not neat with smooth walls. The spaces are lined with pipes and metal hangers, vent shafts, cables, and many other protrusions that further congest the tight, yet expansive labyrinth so few get to see. 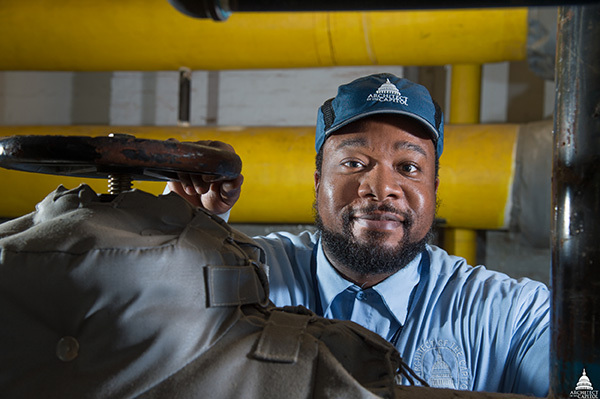 This is where you will often find Air Conditioning Equipment Mechanic Clinton Johnson as he goes about his day. AOC's Clinton Johnson wears a bump cap to protect his head against scrapes, cuts and bruises. Johnson and other members of the Capitol Building jurisdiction maintain the infrastructure of the U.S. Capitol from top to bottom: plumbing, wiring, HVAC, electrical and more. Personal protective equipment (PPE) is issued to each employee to protect themselves, including hard hats. However, hard hats are designed to protect from falling objects, not bumps in narrow spaces where the hats can get stuck, restrict head clearance and can fall off when the wearer is bent over. In 2010, an employee asked for an equipment review for work in tight spaces. Occupational Health and Safety Specialist Gerardo Figueroa took up the research challenge. After finding a superior alternative to hard hats in such spaces, he began spreading the word: bump caps. On the outside, a bump cap resembles an elongated baseball cap with a short brim. Take a peek at the interior and you see squares of gray foam in a checkerboard pattern. This lightweight cap is the key to head protection in tight spaces; it stays on better when bending or leaning over and guards against cuts, bumps and bruises. Figueroa originally ordered 250 bump caps for Capitol Building staff and visited each Capitol Building's shop safety briefing to discuss the new caps. There was modest adoption right away, and the caps began protecting team members like Johnson from minor hazards while working in small, dark spaces. 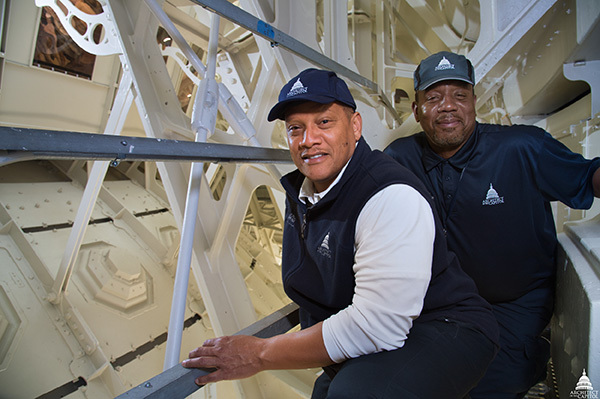 Ricardo Mitchell and Wilbert Lowery inside the Dome, wearing bump caps to protect their heads from low beams and other hazards. But not all Capitol Building employees are required to wear PPE to protect their heads. For example, Laborer Supervisor Ricardo Mitchell and Laborer Leader Wilbert Lowery venture up to the roof almost daily for their work. The steps they go up look more like a ladder than a flight of stairs, and there is a low beam running directly over the bottom step where they could bump their heads when climbing up or down. During the U.S. Capitol Dome Restoration, the roof was a construction site, and Mitchell and Lowery were required to wear hard hats. They saw the advantage of wearing the head gear during their visits to the roof, so when construction was over instead of going back to uncovered heads, they switched to wearing bump caps on a regular basis. 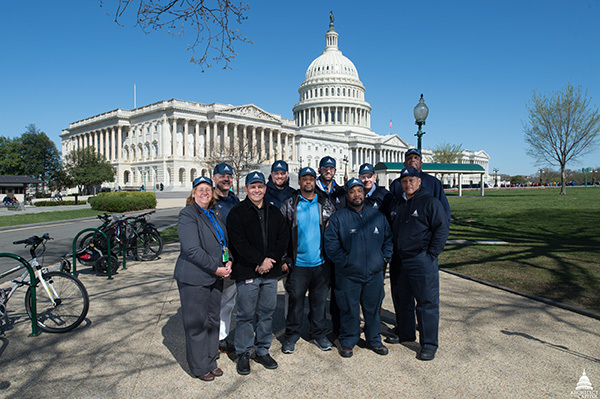 Capitol Building staff proudly sporting their bump caps. Bump caps have become standard-issue PPE for all new Capitol Building employees, and you will regularly see employees wearing their bump caps all day because they are so comfortable and lightweight. These caps come in different styles, with options for longer or shorter brims and flame-retardant fabric (this is important when welding, for example). Wearing a bump cap is a great example of the Architect of the Capitol's commitment to safety — one of the agency's core values. I really enjoy reading these kinds of stories that include interesting details about how the hard-working men and women of the AOC perform their work safely. Well done!